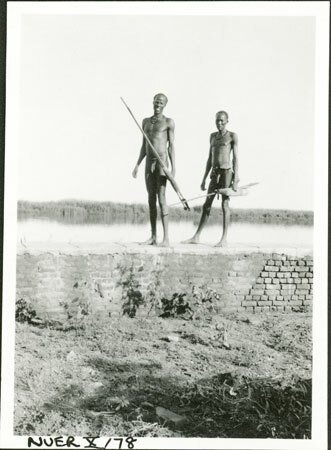 Two men carrying spears and ambatch shields look towards the camera from the top of a brick wall or walkway built at Nasir, possibly near the American mission or government camp. It may have been constructed to prevent flooding of gardens or habitations during high waters in the rains. Evans-Pritchard spent some 4 weeks in 1935 among the Eastern Jikany tribes who live around Nasir. Note on print reverse ms pencil - "28 5 A212" & print front border ms ink - "NUER X/78"
Morton, Chris. "Nuer men on wall" Southern Sudan Project (in development). 03 Jan. 2006. Pitt Rivers Museum. <http://southernsudan.prm.ox.ac.uk/details/1998.355.487.2/>.